No. 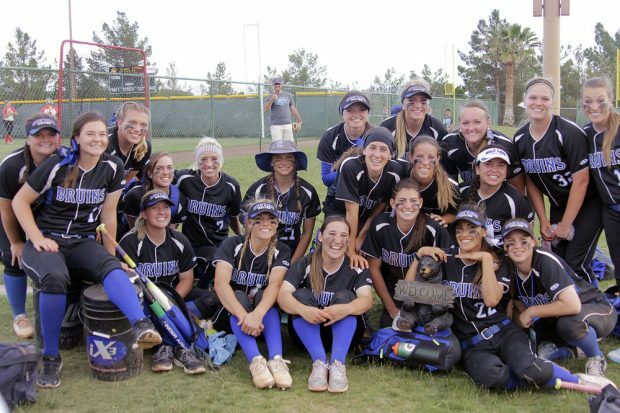 2 seed Salt Lake Community College made a deep run in the NJCAA Division I Softball National Championship last weekend in St. George, Utah. SLCC advanced to the semifinal round before losing to 3-seed Chipola College on Saturday. The Bruins end the 2016 season as the No. 3-ranked team in the country with a 48-9 record. View photos of the SLCC softball team in action against Northeast Oklahoma A&M. SLCC pitcher Kylie Everill throws off the mound during a second-round NJCAA tournament game against Northeastern Oklahoma A&M on Friday, May 19. SLCC outfielder Tina Ford makes contact during her at-bat in a second-round NJCAA tournament game against Northeastern Oklahoma A&M on Friday, May 19. SLCC pitcher Kylie Everill throws to the plate during a second-round NJCAA tournament game against Northeastern Oklahoma A&M on Friday, May 19. SLCC pitcher Kylie Everill looks for the sign during a second-round NJCAA tournament game against Northeastern Oklahoma A&M on Friday, May 19. SLCC infielder Lauryn Goaslind swings the bat during a second-round NJCAA tournament game against Northeastern Oklahoma A&M on Friday, May 19. SLCC infielder Lauryn Goaslind heads for home after hitting a solo home run during a second-round NJCAA tournament game against Northeastern Oklahoma A&M on Friday, May 19. SLCC infielder Madison Sisco slides into home plate during a second-round NJCAA tournament game against Northeastern Oklahoma A&M on Friday, May 19. SLCC pitcher Kylie Everill winds up to throw during a second-round NJCAA tournament game against Northeastern Oklahoma A&M on Friday, May 19. SLCC outfielder Rae Gall makes contact during her at-bat in a second-round NJCAA tournament game against Northeastern Oklahoma A&M on Friday, May 19. SLCC pitcher Lauren Frailey throws toward home plate during a second-round NJCAA tournament game against Northeastern Oklahoma A&M on Friday, May 19. SLCC outfielder Tina Ford bunts the ball during a second-round NJCAA tournament game against Northeastern Oklahoma A&M on Friday, May 19. SLCC outfielder Tina Ford scores a run during a second-round NJCAA tournament game against Northeastern Oklahoma A&M on Friday, May 19. SLCC utility player Brittni Chase signals from the bases during a second-round NJCAA tournament game against Northeastern Oklahoma A&M on Friday, May 19.